This story begins as every other story does- with the extreme fascination for Christmas. Having advent calendars we grew up with as children, the idea of a advent house quickly became a long, sought after item we dreamed about. Around our home, Christmas decorating is a number one holiday priority, with attempts each year to become more grand. As we envisioned what will be the new "big" piece added to our ever growing display, childhood memories stirred and the thought of the Christmas Advent House took center stage. Unfortunately, at the time, this item was as hard to find as the real Santa Claus. So with dreams of owning our very own advent house, the project of building our own began. It's creation seemed to be a wonderful, personal adventure and it would be able to be passed down through our family for generations. Upon our version's completion, family and friend's reactions to the advent house were so positive and heartwarming. After posting pictures of the completed version on the Internet, it connected us with others who share a love for Christmas. It became clear that we were not the only people obsessed with the idea of having an Advent House. There were more. Many more. As requests to build one for other families grew, we decided the time was right. Which brings us to today. We are honored to bring this version of the Advent House to you- from our family to yours. Contrary to common misconception, a true advent calendar only contains 24 numbers and runs from December 1st through December 24th, Christmas Eve. There is no door for Christmas Day. This advent house can be lit. The tower and atrium are lit on December 1st and countdown each day to Christmas Eve. 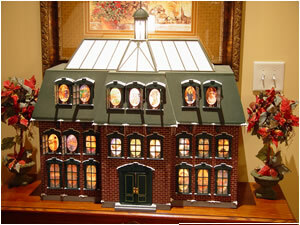 The Christmas Advent House is hand-crafted entirely from wood is a beautiful Christmas display piece. 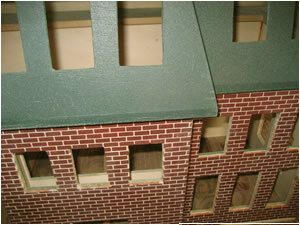 We have created real brick and mortar to give the house a rich and elegant look. Above all, a labor of love goes into the creation of each Advent House. We hope that you will enjoy your house as much as we do and that you share it with your family for generations to come.